You don’t have to miss out this ANZAC Day. 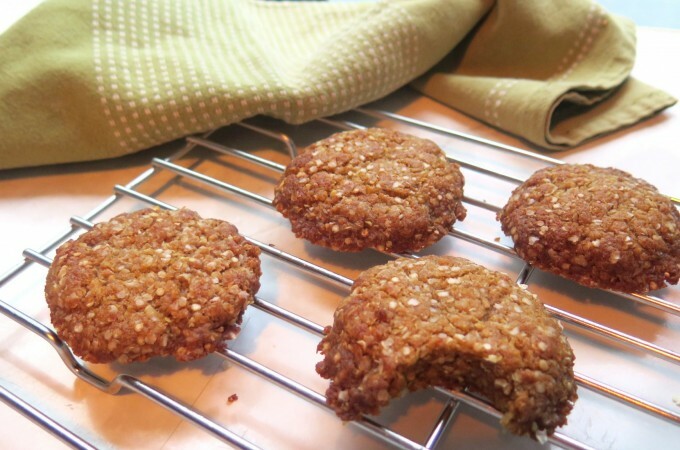 Our gluten-free vegan ANZAC biscuits are a free-from friendly treat everyone will enjoy. Preheat oven to 180°C and line a baking tray with baking paper. Sift flours into a bowl and stir through xanthum gum, quinoa flakes, coconut and sugar. Place coconut oil, golden syrup and water in a small saucepan. Stir over low-heat until oil has melted. Remove from heat and add bi-carb soda. Pour oil mixture into flours and stir to combine. Roll tablespoons of mixture into balls and place on tray. If mixture is too dry to hold, add an addition 2-3 tablespoons of warm water to the mixure. Use your palm to flatten until they are 1cm thick. Bake in pre-heated oven for 15 minutes (chewy biscuit) and 20 minutes (crunchy biscuit). Remove from oven and cool on tray before serving.